Art is not my strongest subject, but a few of my kids can’t get enough! When I found out there was a review coming up for ArtAchieve, I knew I wanted to take this on. My daughter and I were given access to several lessons. In fact, we got to try out Entire Level II, which includes 14 lessons that take you on a journey of art from around the world. 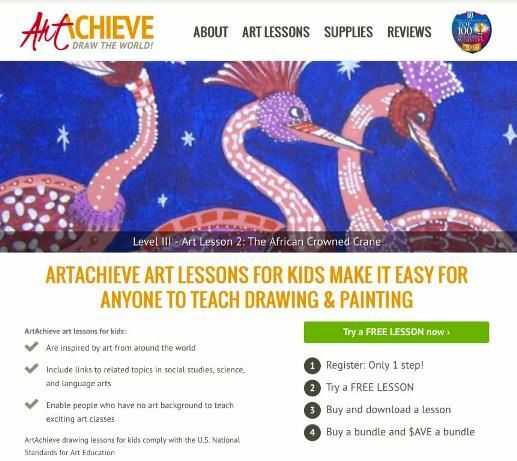 ArtAchieve is an online subscription service where you purchase the individual classes you’d like to take with a 1 year license to use the content. There are levels I-V, or you could get bundled lessons at a significant discount. I chose Level II ($53/year when bundled) for Grace, because she looked at the sample work for each of the levels and chose this one as a good starting point that she would be comfortable with. To get a feel for the program, I highly recommend that everyone try the free lessons and see how they work. As a new user, I was really impressed with the content provided. It isn’t JUST an art class on video, though it does have that. It really makes a nice history, geography, and art lesson. Add in the classical music they recommend listening to during your lessons, and you’ve got even more arts covered during class. John Hofland, the author and instructor, was a homeschooling dad himself and has traveled many places and brought back some art inspiration with him to share with students. He incorporates information about the place that the art was inspired by into the program. You have a choice to either watch your lessons through a streaming video or you can flip through a Powerpoint presentation of the same information. If a video is too distracting for your student, looking through the still text and images of the Powerpoint might be preferable. If your student prefers to watch every single detail step by step, the video option might be better! Either way, you get some background info on the art, a reminder of how to warm up and get ready to draw, printables to support the lesson (warm up sheet and print outs of the drawing for reference), step by step information on how to get started and fully complete the drawing portion of the art lesson, and advice on how to color in the art work. Something I really love is that each lesson allowed for a lot of creativity. No two pieces will end up looking the same, and each student using the program may come up with something that looks dramatically different. There are many times during the lesson where the student is stopped and asked to reflect on what is about the happen during the process of creating the art, or perhaps to think about things they have already done in a different way. Students are encouraged to really take ownership or their art piece, and are reminded that it is best to finish the entire thing before deciding if it’s not what you really had in mind and starting over. Sometimes you need to make changes in the middle of the drawing, and that’s okay. Sometimes you end up not liking your work, and that’s okay, too! It’s a process and not perfection. My daughter really enjoyed the lesson on The Japanese Goldfish. She was just sure that she had messed it up, but ended up changing it up a bit and loved how it turned out. Her favorite part was that she got to pick all of her own colors and accents to really make the picture her own. She’s taken some classes in the past that encouraged everyone to basically do everything exactly the same, and she never liked doing it that way. The way that ArtAchieve allows and encourages that freedom and creativity worked really well for Grace! The teaching was great, especially in the videos. We both liked the camera angles that were used, because they made it very easy to see what was being drawn or colored and it made following along a cinch. I also noticed how relaxing the whole experience was. Mr. Hofland has a soothing, reassuring voice, and much of the video was quiet with light music. There were times in the video where we were instructed to pause the video to complete certain steps. I liked this, because it allowed the lessons to go as long or as short as were needed to complete the art piece for that lesson. I did a few lessons as a student. When I did the lesson on The Ukrainian Cat, my 4 year old saw me and insisted that I draw him a cat to color, too. It’s sort of like drawing your own coloring page and then getting to let loose with the COLOR. He really liked the cat that I made for myself, so he was confused when my second cat didn’t look exactly the same. I told him that it’s hard to duplicate the work, but that it makes it more fun to have different ones! He did color his in. Isn’t it lovely? We chose to complete the lessons that used markers, but there were a few in Level II that used acrylic paint, chalk pastels, watercolors, and paint pens. You can check ahead of time to see what supplies are needed for every single lesson by checking out the supplies page. I appreciated this, because I wanted to make sure we had everything on hand before jumping into the lessons. We’ll be doing the acrylic lessons soon. I love that you can just sort of pick and choose how you want to complete the lessons. Once students have an idea of how the lessons are formatted and how to make the lines and shading, it’s simple to go in and complete exactly the lessons you want to complete.